I am entering the world of two place planes and am coming from a single place plane where I used an Icom A21 with DC headset. 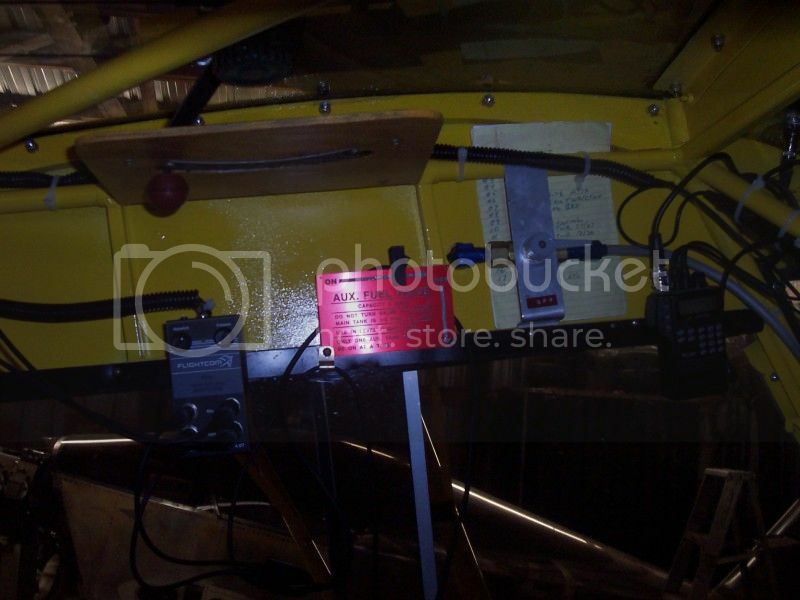 My antenna was mounted at the front lift strut spar attachment. This worked very well and often communicated in excess of 75 miles. What would be an acceptable intercom and headsets for use in the L16? I will probably use the ICOM A21 so where should the antenna be mounted? Moved to the "Radios and Intercoms" from the "Photos" section for a bit more traffic. Your L-16 is the same as a Champ and most people run an external antenna. I have seen them mounted on the gap fairings on the top of the wings, or on the bottom of the engine cowl. One installation that I really liked that I have been thinking about is Scott Gifford in Prescott did a L-16 copy and put the antenna INSIDE the fuselage just behind the seat. The ground plane was a piece of wire screen and the antenna itself mounted to the screen. As everything is fabric or wood back there the reception and transmission was excellent and the plane just looked nice without any antenna's hanging out on the plane. There are various options and you also might do a search for "antenna" on this forum. I would like to know what intercoms are being used and their strengths and weaknesses. My plane will not have an electrical system so the intercom will have to be self powered or I might install a battery pack and possibly a solar panel. Also what headphones are being used? I use an old Sigtronic portable that use to have a cigarette plug. I clipped the plug wires and spliced in a 9v battery plug and it works fine. When I get back home on Wednesday, I'll snap some shots. A battery would last about 15-20hrs. Here's what the modern day version looks like, and they're already battery opperated. A nice thing about the new ones is the Aux input plug: you can plug in an iPod and now you've got tunes! I am very satisfied with the "Pilot Avionics- PILOT PA 200- 2 Place MiniCom" intercom that I bought from the King's School Catalog for about $90 several years ago (and still working on the original 9V battery). The Icom A6 works great with the rubber antenna (I very seldom use my external wing mounted antenna), as long as you use a PTT (about $18) . Have you considered going wireless and doing away with all the cables for audio transmission in the cockpit ? There are several of the necessary components available in the marketplace and more in the pipeline. These would obviously be battery operated and lightweight as well. I intend to go this way for my Chief. I am using a Soft Comm two place intercom. They are available Radio Specific so the connectors will hook directly to your ICOM A21 Radio. With 2 9V batteries, they run for a long, long time. I have a sealed acid battery under the seat which powers it for ever as it also has a 9-35 volt input for external power. I talked to softcom before I ordered it and asked them about adding jacks for PTT lines so I could wire something rather than using the button on the box. They provided it to me with two PTT jacks at no additional charge and even gave me the male plugs to use. I will see if I have a picture to post as I have it velcrowed on the side wall of the plane. I use a regular VHF antenna on the wing root as someone else mentioned. Here is the battery installation with quick disconnect straps so it is legally a temporary installation. Softcomm Intercom held on with velcro to the side wall. Sorry for the poor photo but here's the installation on my L16., realize this doesn't work for anything with a headliner. 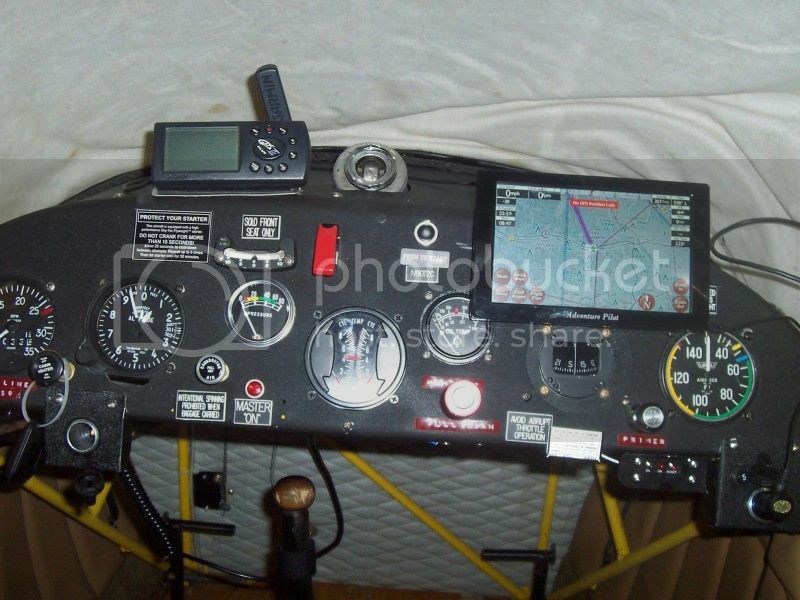 I have a Flightcom two person intercom (cheap but works good) and my JRC radio is attached to the upper window retainer (far right) with the belt clip. I like stuff out of the way (in this case ...up) but as mentioned elsewhere I hate all the wires. My radio is powered by the 25 amp starting battery rather than a bunch of AAA's. Here's the dash with my IFLY GPS setup. Finally figured out how to mount it without using the suction cup which I didn't trust as it fell down twice. I hook the unit on a screw in the dash and use a piece of velcro on the bottom to hold it straight. I was able to get approval on a 337 for the 12 volt power plugs when I installed my battery and Sky-Tec starting system. The Garmin (Plus 3) unit on the top of the dash has served me well since about 1999 but I don't use it much anymore...although it takes a lot less room!